Honolulu, Hawaii - Walk Ride U.S.A.
Honolulu, Hawaii is located on the south side of the island of Oahu in the State of Hawaii. Honolulu is the State Capital. Other communities in this area include Pearl Harbor, Ewa Beach, Halawa, Walmalu and Alea. This area has a number of bike paths and pedestrian paths for getting about, commuting to work or school or for enjoying some of the local parks and beaches. There are hiking paths at Diamond Head State Park to the southeast of Honolulu. The trails offer beautiful views of the shoreline and of the Honolulu skyline. The Fort DuRussy Boardwalk is a 0.6-mile paved pathway that follows along Kahajamoku Beach in the heart of Waikiki. The trail goes past Fort DeRussy US Army Museum. The Hickman Bike Path is a 1-mile long paved pathway located in the Hickman Field area to the west of Honolulu. This area is situated to the west of Honolulu International Airport. The trail follows the shoreline of the entrance to Pearl Harbor. The trail is located in landscaped area adjacent to residential neighborhoods. There are pretty views to the west of the boat traffic going in and out of Pearl Harbor. The south end of the trail goes past Bishop Point with Barrery Chandler and Battery Barri. These are historic armaments that were deactivated before WWII. There are several paved pathways within the Waikiki area for exploring the area on foot or bike. The trails wrap around Magic Island, Ala Moana Regional Park, Ala Wai Community Park, Ainahau Triangle, Fort DeRussy Beach Park and local residential neighborhoods. The Ko Olina Pathway is a 1.5-mile long meandering paved pathway located in the community of Kapolei. The trail wraps around Kohola Lagoon, Honu Lagoon and Nai'a Lagoon adjacent to resort hotels. The south end of the path wraps around Ko Olina Beach Park. The Makapu'u Point Lighthouse Trail is a 1.2-mile long paved pathway located 10 miles east of the eastern edge of Honolulu, near the community of Waimanalo. The trail takes you out to Makapu'u Point Lookout where ther are beautiful views of the rocky shoreline. The Nimitiz Highway Multi-Use Path is a 1-mile long paved pathway adjacent to the highway. The trail spans between the Pearl Harbor Naval Station Main Gate at South Avenue and Valkenburgh Street where it connects to the Queen Liliuokalani Freeway Multi-Use Path. The Pearl Harbor Bike Path is a 5.2-mile long paved pathway that spans between Waipahu Depot Street and Aloha Stadium. This area is on the north side of Pearl Harbor. The Pearl Harbor Bike Path goes past residential neighborhoods, Ted Makalena Golf Course, Pearl Harbor National Wildlife Refuge, Lehua Elementary School, Neal S. Blaisdell Park, 'Aiea Bay and Aiea Bay State Recreation Area. 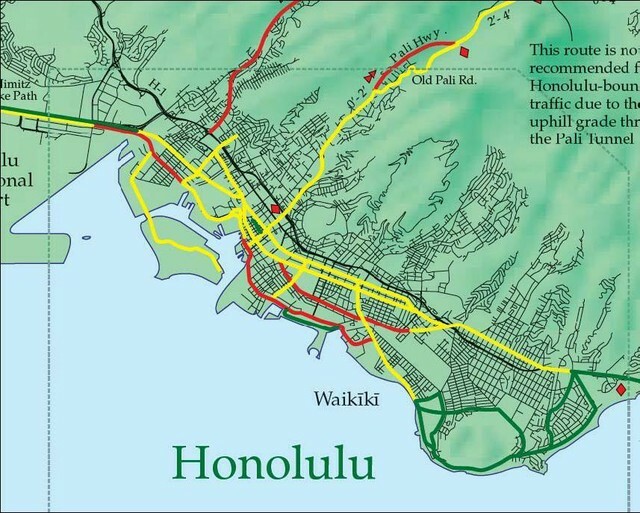 The Queen Liliuokalani Freeway Multi-Use Path, H1 Freeway, is paved and follows alongside the freeway for 4.5-miles. The trail goes past Radford High School, the Moanalua Shopping Center, the Navy Marine Golf Course, Honolulu International Airport and Keehi Lagoon Beach Park. The east end of the trail is located near Middle Street and Kamehameha Highway. The West Loch Trail is a 2.3 mile long paved pathway located at Ewa Beach on the west side of Pearl Harbor. The trail follows the shoreline and connects two residential neighborhoods. The trail starts goes past West Loch Golf Course, the Pearl Harbor National Wildlife Refuge, wraps around West Loch Community Park and ends at Asing Community Park near Fort Weaver Road and Renton Road. Following are links to official off-site resources to find out more details about the recreational trails located in Honolulu, Hawaii.